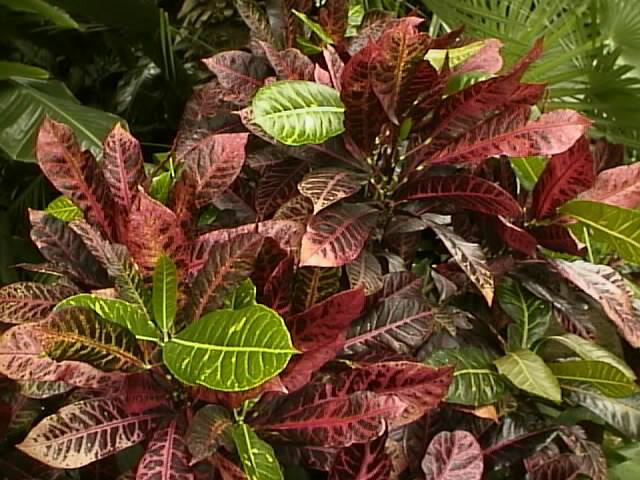 Crotons are tender perennial plants that will grow to three feet tall or more. They are most often grown as house plants or in a greenhouse environment. red, yellow, pink, orange, burgundy, bronze or green. The leaves may be wide and smooth, long and narrow, or very irregularly shaped. Unfortunately, Crotons tend to be pretty fussy about their growing environment. rapid changes in temperature can all cause the leaves to drop. or in containers in a space where the will get full sun. 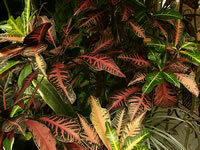 Crotons can be grown in partial shade, but will lose much of their bright coloring. Larger growing cultivars make excellent hedge plantings. Narrow leaved varieties of Croton are considerably easier to grow and care for. 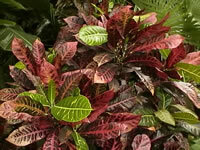 When growing your Croton as a house plant, it should be planted in a rich, commercial potting mix. Grow them in a draft free area where they receive full sun or very bright light for at least 4 hours a day. Night time temperatures should be about 65° and a daytime temperature range of 70°-80°, with 80° being ideal. Crotons require high humidity (near 70%). creating an indoor greenhouse or placing an aquarium nearby. Keep the soil evenly moist except in December and January when you should allow the soil to dry slightly to allow for dormancy. fertilizer specifically formulated for house plants. Repot your Croton in early spring. in the spring or summer and rooted at 70°-80°. Start Croton seeds indoors at any time of the year. Maintain a temperature of 75°-80° within the growing medium until germination, which takes about 30 days.